Yesterday a little known aniversery came and went with little notice in the blogsphere... largely because I was too busy to celebrate it... until now. What is this anniversary? Two years ago I began a weight loss campaign that has been fairly successful. On the morning I started I weighed 415.2, a year later I was down by 123.8 lbs to 291.4, yesterday I was down a further 68.2 to 223.2, a total loss of 192 lbs since I began this whole thing in May of 2006 and only 28 lbs away from my (perverted) goal of 195! Despite the last year not progressing as fast as the first (or as fast as I'd like) it has been a pretty good one none the less, not only did I enter the BMI territory of merely being overweight instead of obese and now largely look like a normal person with a bit of extra flab if you see me without a shirt. Clothing continues to be an interesting area as I'm now down to a 38 inch waist and an XLT T-shirt one would think I'd finally be able to shop at 'normal' clothing stores... which is have true. 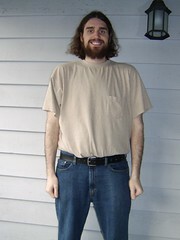 I can finally find jeans and belts almost anywhere (I just may have to dig a bit)... shirts on the other hand air fairly tricky as a good chunk of my height is in my upper body, absolutely requiring an extra inch or two of material so as to let me tuck it in and avoid flashing folks. Some stores like JC Penny has a decent big and tall section, Eddie Bauer also has a few items for a reasonable price (provided they are marked down)... other than that I keep my eyes open for anything marked LT or XLT and that appears to have a reasonable length to it. I am also thrilled to be able to now avoid going into Casual Male XL and paying the ridiculous prices there (even for smaller sizes (if/when they have them in stock)). Back in November I got to go deer hunting with a friend for my third year and ended up wearing my same 4xlt gear that I'd purchased when I was in the 400's because my cheapness (and at the time poorness) prevented me from buying a parka and bibs that fit good. While I don't have any pictures of me in that getup, it was pretty difficult to run around in such a ridiculously oversized outfit which will be replaced one way or another come hunting season 08 (provided I'm able to return to South Dakota). One of the biggest reasons though is the fact that my new employer tends to feed us and feed us well be it as part of a nightly dinner thing for those who decide to work late, other semi-regular events with food or just going down to the local cafeteria for lunch with a couple of co-workers. So far (like in past) I've been doing very good at sticking to my diet most of the time and minimizing the amount of going astray I do... though the degree of temptation sure does make things tricky... especially considering running up stairs to eat with some co-workers and enjoy an interesting variety of what gets ordered is a heck of a lot easier than grabbing my own little thing out of a box of food (that I finally remembered to bring into the office for just such times). My perverted goal from the beginning of this whole campaign was to see sub 200 (ideally 195 as a nice round number) and despite now reaching a weight that looks fairly normal for a person of my height (until you see the excess skin) I surprise people when I mention that I'm on a diet where comments range from "Why would you be on a diet?" all the way up to "Like hell you need one, I need one!" This has become especially common around dinner time at work (if I'm still there then) when someone suggests we go grab something up stairs to which I'll say "Love to, I brought my own", to which they'll reply "Why the hell would you do that? ", to which I respond "Because I'm on a diet." Usually it ends there... sometimes I'll have to add "Because despite having lost around 190 lbs, I've still got another 30 or so I want to lose." On a side note it is now interesting being proportionally smaller than a number of my South Dakota friends and how some felt uncomfortable around 'skinny Brendan' and wished that I'd gain 50 lbs to make them feel at home again. Back in January or February I had a chest x-ray done which required me taking off my shirt. After words the doctor asked out of no where "So how much weight have you lost?" without the topic ever being mentioned previously or (presumably) existing in my chart. How'd he know? 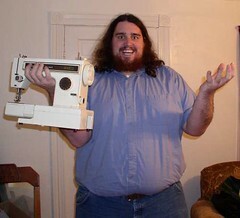 Because I've got the flab of a former fat man who has lost a hell of a lot of weight. Skin is a funny thing... it *generally* snaps back into place for a woman who has had a child as it spent only 9 months being stretched out and has a fair amount of time to recover after the fact. I spent a far longer time with far more stretching of the skin which means at the very least mine will take much longer to recover... if it can fully. As things stands today I've still got a strangely shaped gut for my size as well as a few other bits of flab (fat and skin) that like to protrude at strange times and positions and it will likely take some time (and additional weight loss) for them to go away... otherwise I may be looking at a trip under the knife in a year or three to resolve some of these issues. 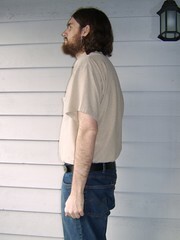 I've never had the best posture and due to my height would tend to slouch a bit (talk people tend to fear short things due to hitting our heads on them so and preemptively duck as a result) and when coupled with my previous excess weight sitting properly and comfortably was tricky as no chair was quite right for me... now that problem has gotten worse. Due largely to some of the excess skin and flab I've still got hanging around properly sitting in a high backed chair doesn't work well as I continue not to fit... only now instead of just being the wrong shape... I'm mostly the right shape with the exception of a spot or two that pushes wrong. To put this in prospective for those without this problem... imagine trying to sit in a well designed chair (for your back)... and then throw a tennis ball or two between you and it and try to get comfortable. A common reaction from those who learn I've lost so much weight is "Don't you just feel so much better?" to which I often respond simply "No, not really." Maybe it's because it was such a gradual loss over such a long time that I didn't notice or the fact that I was actually fairly healthy at my previous weight... I really haven't a noticed a difference in the way I feel or my stamina... though I have developed a slight aversion to the cold where long ago (ie in college) I'd run around on a 10 degree day with snow coming down with just a T-shirt (because I didn't want to be bothered by a jacket once I reached my destination)... now I wait for it to get to about 15 before I think about going jacketless. So that's the last two years in a nut shell... at least when it comes to weight loss. Things continue to go well on the weight loss front though not as fast as I would like anymore. With 28 lbs to go and my current average of ~5 lbs a month... I should reach my goal weight in 6 months maybe and with any luck my post on this subject a year from now will be reporting on my attempts to maintain my weight. On a side note I suppose I could give into the requests/pleads/demands of others and cut my hair and/or shave my beard... who knows, that might get me a little closer to my goal... naaaa.